Highlight your company's name, products and services to attorney-CPAs that are key decision-makers in their firm or practice by sponsoring an event or including an insert in our conference materials at our AAA-CPA Annual Meeting & Education Conference this July in Portland, Oregon. Click here for more information or call Melissa at 888-ATTY-CPA, ext. 3. Market yourself with our newly redesigned member listing. Put your best face forward and greet future clients with a smile! Your photo will appear on Attorney-CPA.com for one year. Including your credentials, work experience and achievements enhances your profile as well as increases your opportunity to obtain clients and referrals. 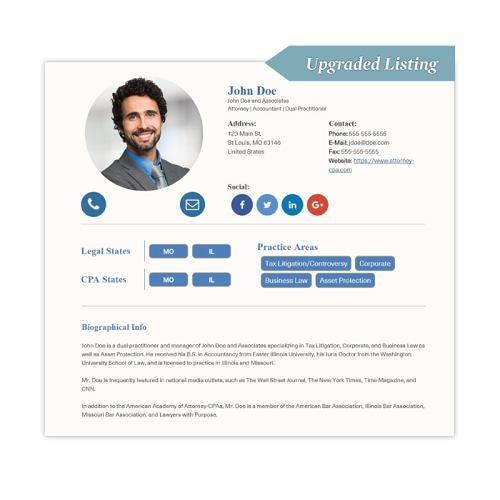 Your biography will appear on Attorney-CPA.com for one year. Your Member Spotlight includes an article, front-page slider on Attorney-CPA.com and a spot in the Weekly Update. Your member spotlight will appear online for one week. Please contact Kimmy at 703-352-8064, ext. 2 or info@attorney-cpa.com with any questions. As a tax lawyer and CPA, James T. Elliott practices income tax and estate tax law, representing business owners, corporate executives and wealthy individuals and their families. Jim's practice focuses on succession planning, effective use of insurance in estate planning, income tax and gift tax planning and litigation support. James T. Elliott began working as a tax professional in 1981 after earning his MBA from the University of Chicago with concentrations in accounting and finance. As a CPA and tax strategist, Jim worked at Price Waterhouse, then PricewaterhouseCoopers LLP for 20 years (10 as a Tax Partner). He then worked for Merrill Lynch for eight years as a Tax Strategist and Director of Executive Tax Services. In 2008, Jim became a Tax Partner at Stern & Kilcullen LLC. In 2010, he moved to Mandelbaum Salsburg PC where he is still Of Counsel. Founded in 2013, the Law Office of James T. Elliott LLC focuses on income tax and estate tax law. For more than 35 years, James T. Elliott has worked as a tax professional and wealth strategist, providing guidance and representation for dozens of high-net-worth individuals and their families. He has helped clients with estate planning, succession planning and matters related to the effective use of insurance. Professional memberships: New York State Bar Association, New York City Bar Association, American Institute of CPAs, American Bar Association, NJ Society of Certified Public Accountants, American Academy of Attorney-CPAs.